★★★★★ These well constructed orange cones arrived as promised. I will use them to practice Harley riding skills in parking lots. They are perfect for my use because they pack one inside the other and I am easily able to transport them on the bike. The only reason I didin't give them 5 stars is because they are a little light. but then again they wouldn't be as portable. The cones are easily mountable on a pieces of plywood the holes are already pre-drilled... Just went back and changed to a 5 Star. ★★★★★ I had bought some hard plastic cones at a dollar store. They were for soccer practice in the yard. We kept those cones outside. Within a short time the hard cones were reduced to shards of plastic. And this child is not rough on things. Enter these softer cones into the story. We have not kept them in the weather yet, but I believe they will hold up much better because of their flexibility. These are really what I wanted to find originally. ★★★★★ Very bright orange color. Marked my newly poured driveway as expected. Kept delivery vehicles and others from pulling on to the new cement before it was completely set. Before you order, pull out a measuring device (ruler, tape, etc.) and visualize the 7" height. You may want something bigger, but these worked just fine for me! 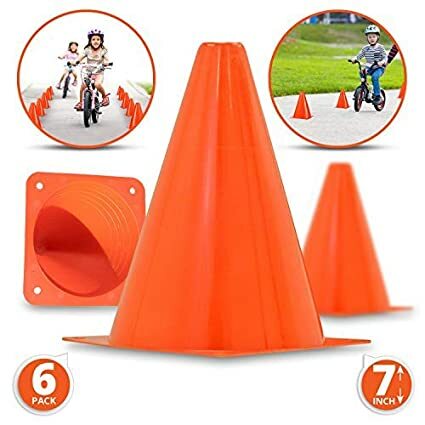 ★★★★★ I ordered these 7 inch traffic cones for a family picnic to use for young children games. They worked great! The cones are small, light weight and stack easily. They are appropriate for preschool thru elementary ages. They shipped to me in two days. I like their size because I have limited space for storing grandchildren toys. ★★★★★ Very nice, just as advertised, bright and cheery. We use them for a little different purpose, to train our little dogs to go to their paper when inside to pee. They always want something to go against and these are just perfect!